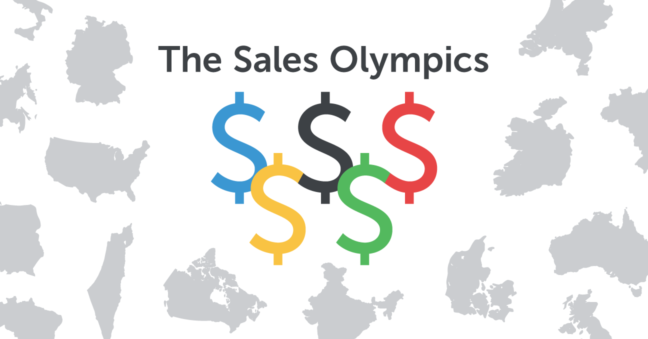 2016 Sales Olympics: What Country Has The Best Salespeople? Since 1896, the world has gathered every four years to compete in the modern Olympics, a beautiful celebration of athletics in diverse forms. Yet, if you ask us, we’d say one group has been unjustly left out: salespeople! To give sales the recognition it deserves, we at Pipedrive compiled data from more than 30,000 businesses around the world. Our goal was to create an Olympic-like competition based on five major sales statistics. Each category of competition includes a gold, silver and bronze medalist, as well as an honorable mention. A total of 19 countries were eligible, and some of the winners may surprise you! Without proactive lead-gen, your entire sales process can fall apart. 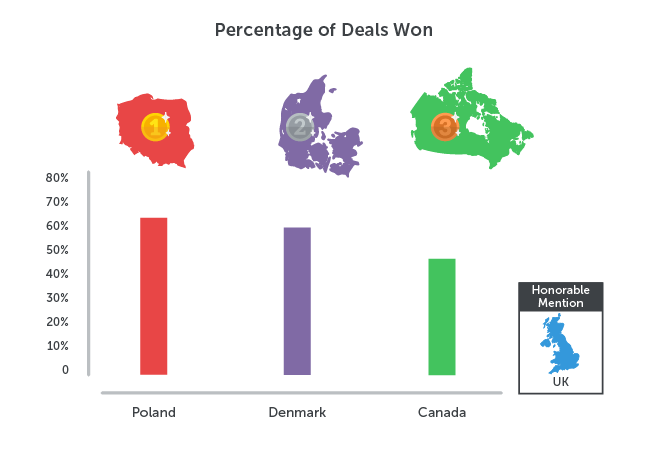 This category awarded those countries whose salespeople created the most deals in Pipedrive this summer. Although not all of these deals closed, consistently adding enough deals into your pipeline is vital to ensure you have the ability to meet your sales goals. Conversion rates aside, Pipedrive users within these countries set themselves up well for success. A profitable lead generation system is not built overnight. Rather, being able to consistently bring new deals into your pipeline requires day-to-day effort in outreach and a solid marketing strategy. Rejection may be common, but you must continue cold calling, emailing and marketing your product or service overall in order to create new potential deals. For more information on which method is best for your business, read our article on cold calls versus emails. Conversion is one of the most difficult performance metrics to master in sales. 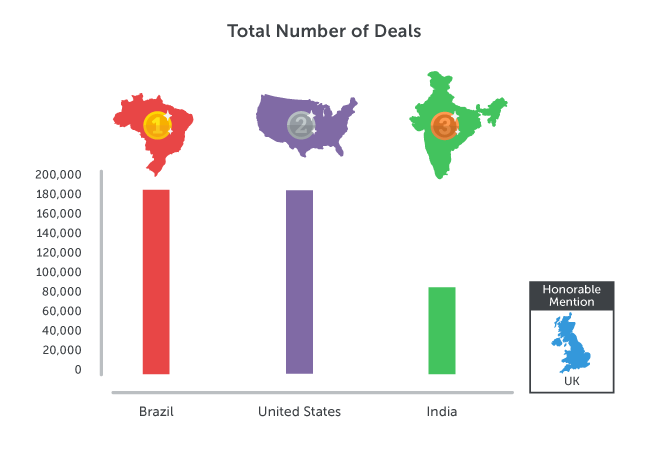 Although every company sees many deals fail to make it through their pipeline, firms within these three countries have done an incredible job of closing deals this summer. A high conversion rate is not a function of chance or luck. To create a sales process that consistently results in closed deals, you must build a healthy pipeline that ensures follow-up and is optimized to keep deals flowing. As a salesperson you must enter the right amount of deals into your pipeline, complete the activities that help them close on a daily basis, and always rebound from failure. Bigger is always better (in sales at least). 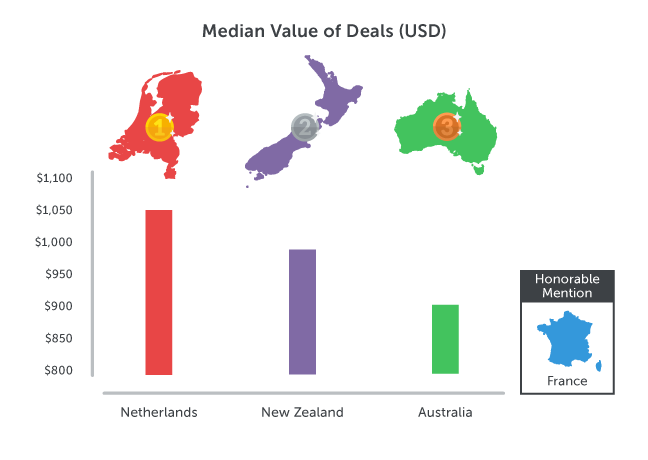 The third category of The Sales Olympics measured the median value of deals won this summer by salespeople in each of the 19 surveyed countries. By focusing on bigger deals, you can bring in more revenue without spreading yourself too thin. While others may have closed more deals overall, these three sales powerhouses were able to bring in the largest accounts. To bring in leads with big pockets, you must discover how larger firms make purchasing decisions. Talk to the decision makers in companies you have sold to previously, learn about what drove them to buy, and replicate your actions accordingly. Once you understand your target audience, focus on firms with expansive budgets. Maximize your revenue by presenting them with logical add-ons and product bundles. Soon, you’ll find your deal value going through the roof. In sales, you cannot control your results, only your actions. By discovering the actions that help drive sales and completing them on a daily basis, you will see an improvement in your conversion rate and overall pipeline health. 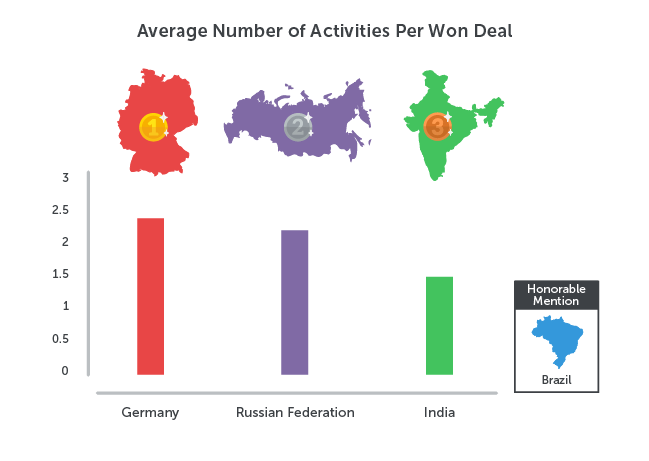 This category awards the three countries where salespeople completed the most activities per deal on average. It may not be a glamorous statistic, but it’s proven to help drive sales. There is no optimal amount of actions that you must complete to close deals. That being said, consistent warranted follow-up prevents deals from falling through the cracks and can only help your sales process. As soon as you complete an action associated with a deal, such as a phone call or lunch meeting, immediately schedule your next action to ensure deals do not get stuck. More action leads to more sales. The faster you can move a deal through your sales pipeline, the quicker you get paid. Sounds pretty good, right? 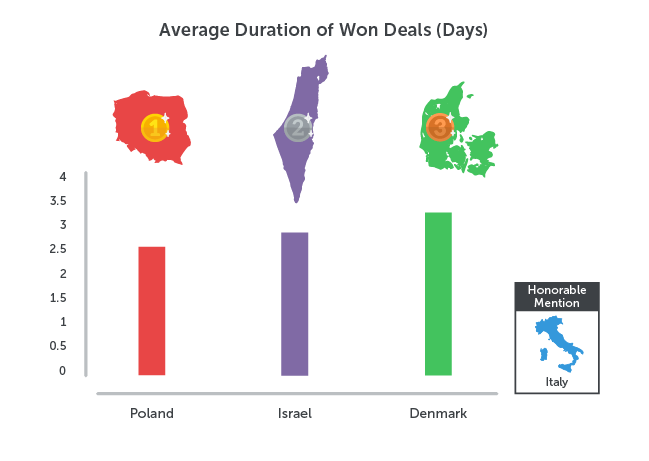 Our fifth Sales Olympics competition was based on the duration of won deals. Pipedrivers within each of these three countries exhibited incredibly rapid deal closure and were able to convert potential leads to paying customers in under four days on average! Use a simple sales CRM designed to help small business close deals! Not only will Pipedrive help you stay focused and on top of your complex sales process, it will also help you schedule and complete the actions that drive speedy conversion. If you did not find your country on the podium in this year's Sales Olympics, sign up for a free 30-day trial to start selling more, and closing deals like never before — and maybe next year, you’ll be up there, celebrating on the podium.